Fiddle playing is so integral to the national spirit of Scotland that during the 18th century, even in the midst of English persecution and fiery Scot nationalism, the humble instrument became more popular than the bagpipes. Good reason for that, actually. This was also the period that public dancing became popular, and whilst y'ken dance to the sound of the pipes, y'cain't and maintain y'wits about ye. Also: Fiddling workshop, 8:30 a.m. to 12:30 p.m. Saturday at the University of Hawaii at Manoa music department complex, rooms 36 and 108. $30. Thanks largely to Scots emigrating to the New World, fiddles in hand, we've achieved bluegrass. The connection is that close. And now that the eminent Scottish fiddler Alasdair Fraser is in the islands, we can ask that deeply important question for the ages -- do you get a crick in your neck from playing the fiddle? "Crick? Ah, noo," exclaimed Fraser, and then ruminated on it. 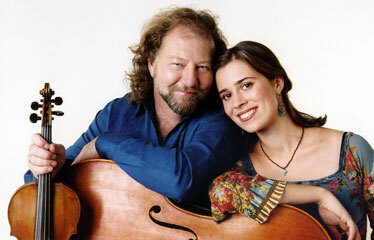 He was on cell phone from Maui, driving up the slope of Haleakala, with cellist compatriot Natalie Haas at the wheel. They'd just performed at the Maui Arts & Culture Center. "I think that because I have to move around when I play, where'ere the music takes me. Dancing, that's it. I'm not like the first violin of an orchestra, poor lad, who must play straight and unmoving." Fraser and Haas are an unbeatable team at the moment, recording lovely music that interplay his smoky fiddling with her stately cello, creating a kind of modern string-chamber music out of ancient reels and strathspeys. Their aptly named "Fire & Grace" album swept the Scots Traditional Music Awards a few years ago. They'll be on Oahu on Saturday for morning workshops at the University of Hawaii-Manoa and then a free concert that night at 'Iolani School. Opening for Fraser/Haas will be the Jig This School of Irish Dance, Curtis Vandeloop of Two Hearts, the Royal Scottish Country Dance Society, the Celtic Pipes & Drums of Hawaii, and local fiddler Lisa Gomes and Friends. Gomes is just about as excited as can be about the concert. "Alasdair's been an inspiration to me for many years," she said. "He's what the music is all about -- traditional music as an avenue to your soul, it wakes you up from the inside and gets you in touch with ethnic roots and deeper cultural images. "Alasdair plays in such a way that you feel as if you've been transported to Scotland to a big, happy, festive party. He makes the music come alive with a positive, rascally quality. Alasdair is dedicated to helping young musicians find their 'inner drummer' -- you don't have to be Scottish to appreciate the music, but when you play with your heart, with an understanding of the culture, then you're playing Scottish music as it's meant to be played." EVEN FRASER had to start somewhere, and it was playing classical violin in the "strings class" in public school in Clackmannan, Scotland, while his dad played bagpipes at home. "It was a double life, yes, and I became interested in the links between Scots culture and music," he said. After a stint as an oil scientist -- his university degree is in physics -- Fraser began to devote himself "to my life's work" in 1985, spreading the joy of Scots fiddling worldwide and, in the process, planting seeds of an indigenous Scots culture. Which explains the many workshops he conducts. "I like to light fires," he laughed. "I want not only to teach how to play, but to play in a way that's freely expressive and individual. Classical music can be quite intimidating and narrow to a beginning player. I want them to find the joy at the heart of it. That's what I and the Suzuki classes have in common." Is traditional Scots fiddling having an upswing of popularity, or is it simply easier to access it these days? "Oh, it's very healthy right now! As are all traditional arts in Scotland. There are new compositions and songs and dances being written right now, relevant to life in 2007. We aren't living in the past!" Fraser's favorite fiddle was made in 1760 -- "Although I'm always flirting w' others!" -- and Haas' cello was recently "made by a fellow in California. I like the history and sound of my fiddle, but it's great to have a relationship with your maker, yes?" Who has the most volume? A question that causes both Fraser and Haas to giggle. "I have to say she has more volume. I have to," Fraser decides. If Fraser doesn't get cricks in his neck, does Haas get sore knees from clutching the cello? Fraser drops the phone, then declines to answer, handing it over to Haas: "Let's just say I have calluses where people shouldn't have calluses," she declares. OK, too much information. How are they enjoying Hawaii? "We've played venues everywhere, but this is the first with a drive-up volcano," said Fraser. "What a sight! "I should ha' known I'd wind up in Hawaii one day. On my Dad's wall in Stirling, he has an ukulele hanging, and there is such power in the wee instrument. Kind of like a fiddle."